Not since the 2014 Tour de France Grand Départ has Yorkshire experienced such a huge figure on a single day of racing, and that bumper crowd on Sunday helped ensure the third edition was officially the biggest one yet with overall attendances rising from 2 million to 2.2 million year on year. Entire communities turned out on the roadside to witness the peloton pass though as they traversed the 194.5km route from Bradford to Fox Valley, Sheffield, and each of the day’s eight categorised climbs were also packed with masses of cheering, colourful and enthusiastic fans. The parcours was also lined with incredible, eye-catching land art as pictures of Yorkshire were beamed to a record 180 countries globally. Spectators were treated to exciting action as well with Pauwels breaking clear on the tough concluding loop and he was joined by Dimension Data team-mate Omar Fraile before the race concluded in Stocksbridge, Sheffield. The duo then pressed home their advantage with Pauwels leading Fraile over the finish line to seal the biggest victory of his career and a 1-2 for his team who also topped the Doncaster Sheffield Airport and FlyBe Team Classification. Jonathan Hivert (Direct Énergie) rounded out the podium six seconds later. Those same three riders also claimed the top three positions on the General Classification with Pauwels taking the blue leader’s jersey sponsored by Welcome to Yorkshire. Australian Caleb Ewan (Orica-Scott) won the Yorkshire Bank Points Classification, Dutchman Pieter Weening (Roompot–Nederlandse Loterij) sealed the Virgin Trains King of the Mountain prize, and fans on Twitter voted Dexter Gardias (Bike Channel Canyon) the Most Aggressive Rider sponsored by Dimension Data. The third annual Tour de Yorkshire got off to a dramatic start on Friday 28th April 2017 with Dylan Groenewegen winning the opening stage for a second year in succession. Unfortunately, however, a large crash near the finishing line in Scarborough took out many of the riders, with Magnus Cort Nielson (Orica-Scott) and Marco Haller (Katusha) coming off worst and being transferred to hospital with suspected broken collarbones. Huge crowds turned out along the route, which started in Bridlington and wound its way inland through the Yorkshire Wolds and then up in to the North York Moors before a frantic finish along North Bay in Scarborough back on the Yorkshire Coast. An eight-man breakaway formed after 15km and Etienne Van Empel (Roompot) was the first of those riders to top Garrowby Hill and Goathland to earn himself a spell in the best climber’s jersey. The last escapees were finally caught with 8.3km to go, but before then the peloton had been split to shreds on the ride to Robin Hood’s Bay. Groenewegen was one of several star sprinters to drop off the pace on that steep ascent but his LottoNL-Jumbo team-mates worked hard to bring him back into contention and the Dutch champion repaid that faith, just as he did in Settle in 2016. The 23 year old powered to the line and held off a late challenge from Orica-Scott’s Caleb Ewan once again for his first win of the season. The bonus seconds awarded for that victory meant Groenewegen opened up a four-second advantage over Ewan in the General Classification and ensured he will wear the blue leader’s jersey sponsored by Welcome to Yorkshire for the second stage. For information about Stage Two of the race, please see the separate news item on the Yorkshire Dales website entitled “The Tour de Yorkshire comes back to the dales again“. The Bank Holiday weekend of May 2016 saw the second “Tour de Yorkshire” cycling event taking place in Yorkshire. On Friday 29th April 2016 the men’s race started out in the East Yorkshire market town of Beverley from where the cyclists travelled through the gently rolling countryside of the Yorkshire Wolds to Market Weighton and then on to Riccall and Tadcaster in the Vale of York. It was then on to Knaresborough and along LowerNidderdale to Pateley Bridge with the first “King of the Mountains” climb at Greenhow Hill, the pink jersey for the day being won by One Pro Cycling’s Pete Williams (who comes from nearby Skipton and won the day’s grey jersey for “combativity” too). The peloton then descended in to Grassington and through Cracoe and Hetton, Gargrave, Coniston Cold, Hellifield and Long Preston to finish (via a sprint loop out to Giggleswick Scar) in Settle. The first stage was won by Dylan Groenewegen of the Netherlands for Team LottoNL-Jumbo. The second stage of the men’s race took place the following day, with the riders setting off from Otley to Harewood and Pontefract to finish the day at Doncaster in South Yorkshire. competing, though unfortunately there were technical problems with relaying live coverage of this and the men’s event too. Hitec Products’ Kirsten Wild won the women’s race, while Team Sky’s Dutch Danny van Poppel took Stage Two for the men. The men’s racing continued on the third and final day, with the third stage starting out from Middlesborough on the Yorkshire Coast and heading inland through Guisborough and Great Ayton down to Northallerton and Thirsk in the Vale of Mowbray. From there came the “Category One” climb up Sutton Bank and on to Helmsley in Ryedale, Kirkbymoorside and Hutton le Hole before another strenuous climb up over Blakeley Ridge and down in to Grosmont to meet the Yorkshire Coast at Whitby. The rest of the route ran along the Yorkshire Coast southwards through Robin Hood’s Bay to the final finishing line at Scarborough, with Direct Energie’s Thomas Voeckler both the winner of the stage and also the full three day race overall as well. After three days of racing the inaugural Tour de Yorkshire has been hailed a tremendous success. The event, which took place over the Bank Holiday Weekend on 1st – 3rd May 2015, was arranged as a “follow up” to the Grand Depart of the Tour de France (which of course was held in Yorkshire the previous year) is expected to run on an annual basis, with this year’s racing taking in the North York Moors, the Yorkshire Coast the Vale of York, the rolling hills of the Yorkshire Wolds as well as the challenging ascents of West Yorkshire’s Bronte Country. Starting out on Friday 1st May 2015 Stage One peloton set off from Bridlington and passed through Dalby Forest (itself already famous for its mountain biking events), Pickering, Rosedale, Whitby and Robin Hood’s Bay before ending the day in Scarborough. The stage was won by Team Sky’s Lars Petter Nordhaug of Norway with some riders including Yorkshire born Ben Swift and Eddie Dunbar (the youngest racer in the event) having crashed out of the race on an unexpectedly slippy descent in to Grosmont. Saturday 2nd May 2015 saw Stage Two of the event, with the riders setting off from Selby and cycling east in to the Yorkshire Woldsand then looping back westwards for an exciting finish in York, where a separate women’s race was held earlier in the morning. Ikon-Mazda’s Louise Mahé won the women’s event, while Team Lotto’s Moreno Hofland from the Netherlands won Stage Two for the men. 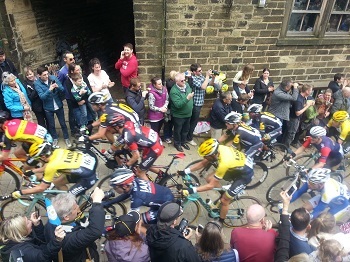 The third stage of the event on Sunday 3rd May 2015 began in Bronte Country and saw world class road cycling competition returning to some of the terrain covered by the Grand Depart in 2014, though this time tackled in the opposite direction. As such Cragg Vale above Calderdale became the event’s (and the country’s) longest continuous descent (in the Grand Depart it was a gruelling ascent) in to Hebden Bridge and on to Haworth‘s famous main street, and a new section through Oakworth and Goose Eye on to Silsden, Addingham (where it is rumoured that the event was watched by the British Prime Minister, David Cameron), Ilkley, Otley and a grand finish at Roundhay Park in Leeds. BMC Racing’s Ben Hermans of Belgium won Stage Three, but the overall winner of the whole event (besides the people of Yorkshire of course !) was Team Sky’s Lars Petter Nordhaug, with BMC Racing’s Samuel Sanchez of Spain and Europcar’s Thomas Voeckler of France coming in second and third place respectively. An estimated 1.5 million spectators turned out at the roadside to watch the racing at over the three days in scenes reminiscent of the Grand Depart of the Tour de France the previous year. It would seem that the historic county of Yorkshire‘s reputation as a welcoming and challenging destination for cycling events at the international level has been secured for years to come ! Teams for the forthcoming 2015 “Tour de Yorkshire” cycling race have now been announced, and it is understood that Sir Bradley Wiggins will be taking part (having missed out on the Grand Depart of the Tour de France which took place the previous year. Sir Bradley’s own “Team Wiggins” will be competing against the likes of Team Sky, Team Giant Alpecin and Team One Pro Cycling (headed by the former England cricket star Matt Prior). Stage One of the event is scheduled to take place on Friday 1st May 2015, starting out from Bridlington on a route which leads through the North York Moors and back along the Yorkshire Coast down to Scarborough. Stage Two is scheduled to start in Selby on Saturday 2nd May 2015 with a route which takes the cyclists in to the Yorkshire Wolds and then back in to the Vale of York to finish in the City of York itself. Stage Three is scheduled for Sunday 3rd May 2015 with most of the action taking place in the Bronte Country area of the West Yorkshire Pennines. A considerable part of the stage retraces the second day of the 2014 Grand Depart (albeit in reverse) with Huddersfield, Haworth, Keighley and Skipton being taken in on a route which starts in Wakefield and ends in Leeds (which was of course the starting point of the 2014 Grand Depart. For more information, please visit the official Tour de Yorkshire website.